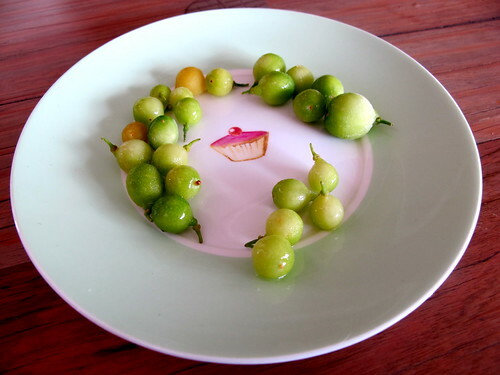 First of all, how cute are these tiny native desert limes? 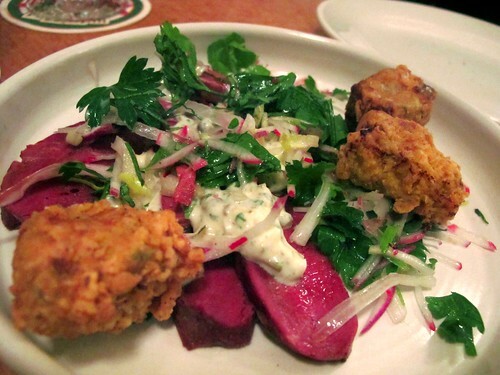 Matt Wilkinson gave me a taste of them on my most recent visit to Pope Joan. 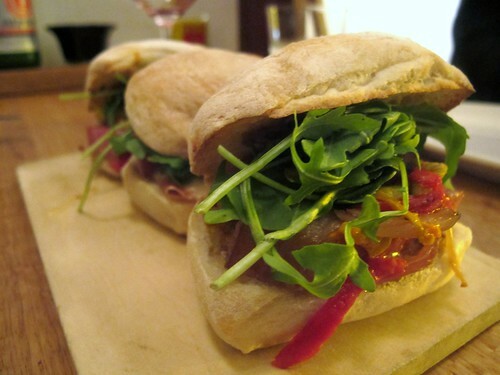 At the time, he was experimenting with pickling them and putting them through a grain salad. 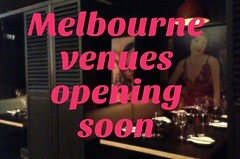 Hopefully they'll also be muddled in cocktails at the bar he's going to be opening next door to Pope Joan, The Bishop of Ostia (named after the illegitimate son whose birth revealed Pope Joan to be female, if Wikipedia is to be believed). 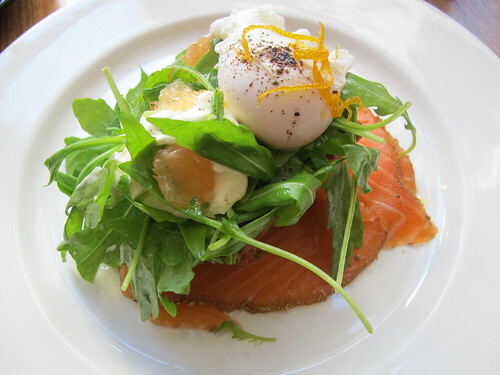 The best thing on the current Auction Rooms brunch menu (apart from the knuckle sandwich) is the salmon pastrami on a potato and quinoa rösti (the quinoa gives the rösti a really interesting texture) with a poached egg, pink grapefruit, rocket and crème fraîche ($16). Auction Rooms has also added Bloody Marys to its brunch menu. This pleases me greatly. The Japanese/French hybrid thing they've got going at Heirloom extends to their breakfast menu. When we visited on one of our recent Bourgeois Breakfasts, a highlight was the panko crumbed free range egg and asparagus with smoked almond, preserved lemon and burnt butter ($16). Delicious horse tartare, at an Italian restaurant whose name I will not mention given that last year, following the legalisation of horse meat for Australian human consumption in July, death threats were sent to WA butcher Vince Garreffa from Mondo Butchers and to the other Melbourne restaurant which held a special horse meat dinner I attended. 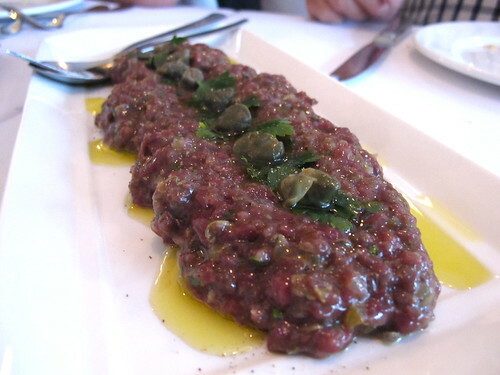 I've eaten horse meat a few times in Italy and love the lean, mild, sweet taste of it. While I understand why some would have a cultural/sentimental aversion to eating horse (similarly, I could never bring myself to eat dog, because I love these two too much), I am bewildered by those who want to attack other people and restrict their freedom to choose whether or not to eat a meat which is perfectly legal (horse meat has been produced in Australia for human consumption for years, but prior to last July it was all exported). Given that these particular animals are slaughtered by Mondo Butchers under government-approved and closely scrutinised conditions, it also seems inconsistent to me that such people would protest outside a restaurant serving horse - as was the case at the horse dinner I attended last year - but not outside restaurants serving, say, lamb. If dog meat were legalised tomorrow, I sure as hell wouldn’t be buying it (and would probably give Monty and Nessie an extra pat and cuddle next time I went to Mum and Dad’s) but I wouldn’t be protesting outside a restaurant serving it or sending death threats to the butcher! 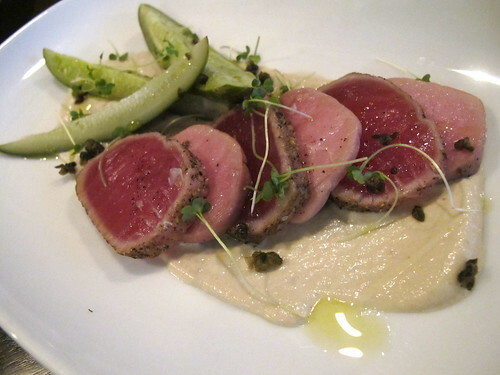 Moving on to a different restaurant, the $15.50 vitello tonnato at Jorg consists of discs of poached veal interspersed with discs of pepper crusted, seared tuna. When I was taken there by M and Zia P, it was my favourite dish. 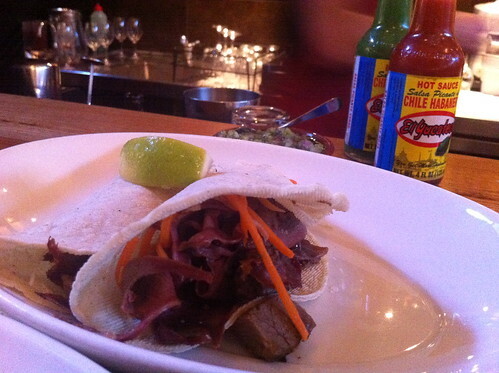 Mamasita braised veal tongue and ox cheek tacos with pickled vegetables and ghost chilli mayonnaise ($6 each). YES. I've written before about the special four course Sunday lunch at Embrasse. 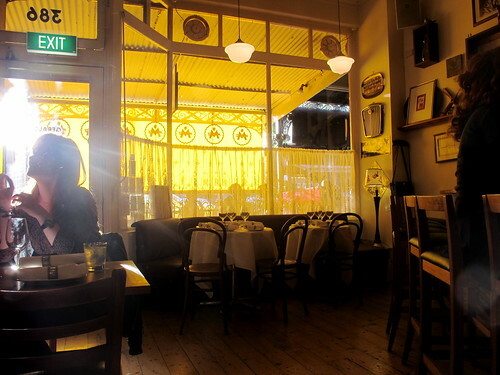 What I didn't realise was that they also do lunch Thursday to Saturday, $38 for two courses or $45 for three courses - but of course in my opinion you MUST also order a serve of the aligot (crazily elastic, cheesy mashed potato) for your table to share. A few weeks ago I organised a big group of people to have Saturday lunch at Embrasse to celebrate the lovely Chontoozie's birthday. 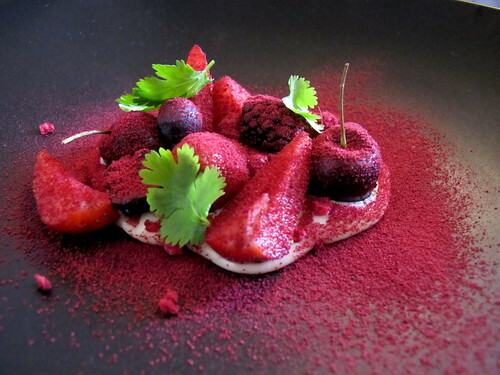 The highlight for me this time was the dessert of local berries and cherries with honey custard - simple and beautiful. How do you like your house martini? DECONSTRUCTED, that's how. From the new Autumn cocktail menu at Der Raum. 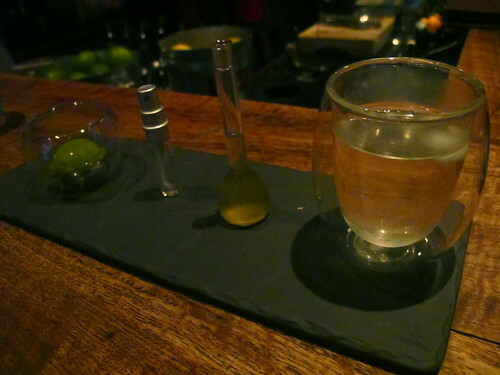 A few weeks ago I finally, FINALLY visited Gerald's Bar, the Rathdowne Village locale Gourmet Traveller dubbed its 2010 Bar of the Year (and which David Chang memorably likened to being on mescaline). But I wasn't sampling the usual fare Gerald's has on offer: Matt Wilkinson had taken over the kitchen to test out some dishes from his first draft menu for the opening-later-in-2011 restaurant, Hen & Coq. The meal was a bargain at $55 for five courses or $85 for nine courses, and my charming dining companions were Matt C and (frequent Melbourne Gastronome hand model) J, both Gerald's Bar devotees. As we walked in we sniggered at the sign in the front window: "To showcase Matt's new venture, we have suspended our usual menu. Tomorrow it's back to the slop Gerald cooks". 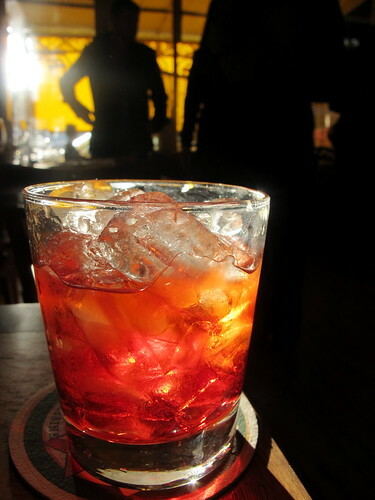 The negronis were flawless. 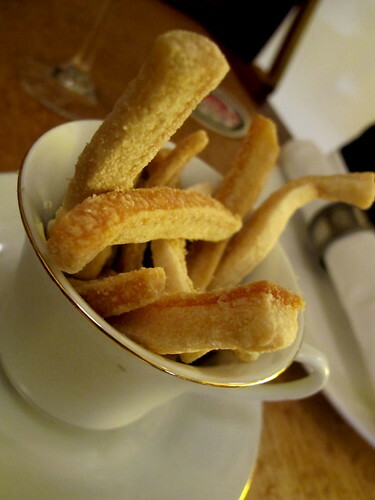 As we drank them, we munched on what Matt described on the menu as 'classic butcher pork scratchings'. Other highlights were the Cuban sandwich, and a dish which Gerald insisted everybody eat first before he'd tell us what it was: smoked ox heart and crumbed sweetbread salad. 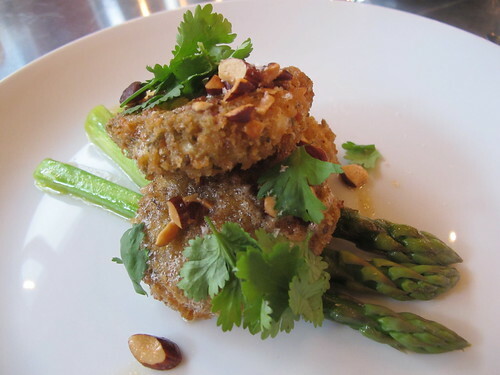 While I'm quite partial to sweetbreads in small doses and guessed what they were right away, I confess that I'd've approached the dish rather more tentatively if I'd known it was heart. But ignorance is bliss - we loved it! By this stage in the meal we'd moved on to a bottle of Mornington Peninsula lagrein (I hadn't been aware that much lagrein was grown anywhere outside of Northern Italy, let alone in Melbourne's own backyard!). 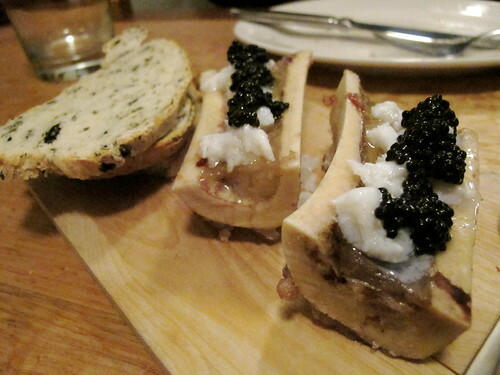 The high acidity helped with the outrageous richness of the next course: Warialda Belted Galloway bone marrow, crab and caviar. Oh, MR WILKINSON. 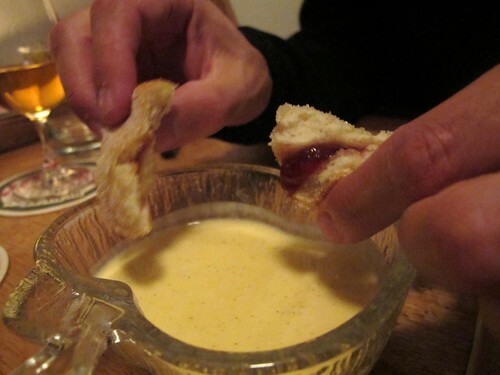 We finished off with what the menu rather conversationally described as 'a pot of custard or as the French say “crème Anglaise” with doughnuts'. 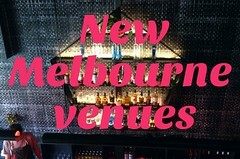 Once again, J acted as the Melbourne Gastronome hand model. It was a fun night that not only made me look forward to the opening of Hen & Coq down the track, but keen to return to Gerald's ASAP. I keep reading Essjay's tweets about her frequent meals at Gerald's, and they always sound so bloody good! Lagrein isn't all that common and I didn't know there was one coming out of the peninsula. Who produces it? The one I'm aware of is from Cobaw Ridge in the Macedon ranges. I did notice recently that there are a couple of blends from South Australia. I almost dare not mention that I've been to Geralds on Monday and Tuesday this week already...oops! I don't mean to :-) It just happens. I like your take on the horse meat "saga". Ooo fun... loving this post.. I always look forward to this, so I can see where it's worth it to drop by! Awesome eclectic combo of restaurants and dishes Claire. Greta post. Awesome, as always. Meanwhile, I just keep thinking how great would a day be which took in all of these...? drooling over that marrowbone at the moment!